After playing with my Echo Dots for a couple of days I really want to start replacing outlets & switches to make a full smart house. Do I need to, no. But the ability to turn a light on or off by speaking would rock. Especially in our bedroom, where I have to stumble past the bed to my wife’s side in order to turn her nightstand light on. 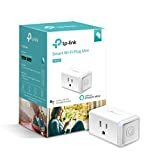 Currently looking at just a TP-Link Smart Wi-Fi Plug Mini for her lamp because it only takes up one outlet. There are other options that only take up a single outlet, but I’ve read good reviews on them.